"My grandmother passed this recipe along years ago. She fixed them as a quick treat for her grandsons who had been hunting all morning. Now I take them to everything from baby showers to Christmas parties to game day gatherings. They are always a hit. I serve dipping sauces of mustard and ketchup. Easy!" Preheat oven to 425 degrees F (220 degrees C). Spray 24 mini-muffin cups with cooking spray. Heat a skillet over medium-high heat. Cook and stir beef and onions in the hot skillet until browned and crumbly, 5 to 7 minutes. Drain excess fat and set aside to cool. Combine flour, white sugar, baking powder, and salt in a large bowl. Whisk milk, ketchup, melted butter, eggs, and mustard together in a separate bowl; stir into flour mixture until just moistened. 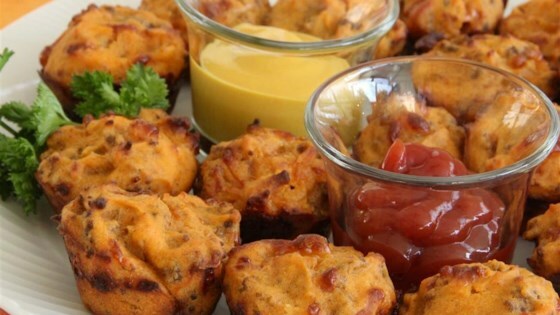 Fold ground beef mixture and Cheddar cheese into batter; spoon into each muffin cup. Bake muffins in preheated oven until a toothpick inserted into the center comes out clean, about 15 minutes. After adding all ingredients into batter, if batter is a little stiff, I use a tablespoon of water to soften it. I'm ready to add bacon next time!